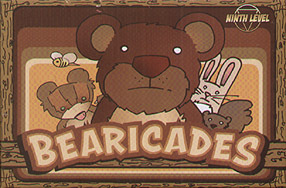 BEARICADES is a forest themed tower defence game for 1 to 4 players. Defend your forest creatures and recruit bears to BEARicade your forest against the forces of evil and greedy lumberjacks! Grrrrrr! The lumberjacks attack in waves using chainsaws dynamite, and even robots to make your BEARicades and animals run away! During the day, players set their defences against the lumberjacks sent against them by the other players. During the night, recruit predators (like Wolf Packs, Cougars, and the Angry Bees) to aid your cause. Using 16 unique animals and your drafted predator allies can your forest survive? Grrrrrrrr!! !